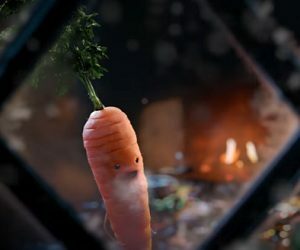 The British supermarket chain Aldi has released the Christmas advert, introducing Kevin the Carrot. The 60-second spot, narrated by the former Harry Potter star Jim Broadbent, features Kevin on the table of food laid out for Christmas, as he embarks on a quest to meet Santa. His journey to the chimney, where the mince pie is placed for Santa, proves to be very dangerous as he must pass over many obstacles, more or less difficult, such as a plate with a mountain of hot smashed potatoes, a plate with steak and baby carrots, which got him frightened, a plate with potatoes which almost fell on him and made him get hurt because of a grater left on the table, a bucket with ice cubes, where the champagne is placed, a candle and others. “’twas the night before Christmas, a carrot gazed at the sky, thinking “I could meet Santa when he gets his mince pie”. But a Christmassy spread, though a joy to us all, can be quite scary when you’re three inches tall. Still our carrot went forth on his dangerous quest, and soldiered on bravely to the chimney breast. He finally arrived. Though exhausted with things, he said to himself “Just a quick forty winks”. Then all of a sudden, young carrot awoke flying high over London or Glasgow. So the sleigh flew much faster that cold Christmas Eve, put on by a carrot, we like to believe” – says the voiceover. The spot ends with Santa’s sleigh up in the sky and Aldi’s tagline on the screen (Everyday Amazing), along with the hasgtag #KevinTheCarrot. The music theme used in the ad is the Home Alone movie theme.